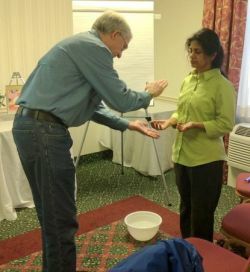 Miriam Smith, Certified MCKS Pranic Healer/Teacher || Share Pranic Healing - New England on Facebook. Pranic healing is a non-touch healing system. Individual healing sessions usually of one hour's duration. Sessions are specific to the patient's requests and needs. Held at your location. 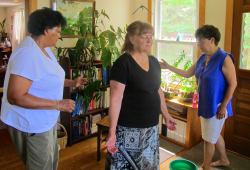 For these, Miriam leads a meditation for the group, followed by individual healings. These sessions may be done via webcam (Skype) or at a specific time without use of a webcam. This also is called Distance Healing. Note that all energy healing is performed without physical contact and is not dependent on the proximity of the healer and patient. The healing is equally effective in person or at a distance. For more information about energy healing, please go to the Energy Healing page. This weekly meditation on Thursday evenings opens the heart and crown chakras of the meditator. Life energy is channeled through the body of the meditator to the earth and its inhabitants. The energy of the body is cleansed and stress is relieved. The body is energized. This monthly meditation invites the group to become a channel for the downpour of Divine energies and blessings. In the process, the group and the individual meditators become active channels for the Divine energies directed to Earth and all people and beings. For more information, please go to the Meditations and Practice Sessions page.